Because We Go To Heroic Lengths. We’ll send the boys around if you don’t enjoy our rich tomato base topped with cheese, pepperoni, semi-dried tomatoes, mushrooms, kalamata olives and anchovies. Tomato Base, Cheese, Pepperoni, Semi-dried tomatoes, Mushroom, Olives, Anchovies, Lemon Wedge. Devour Hero’s flavoursome BBQ sauce base topped with cheese, shaved leg ham, pepperoni, prosciutto and rib eye bacon. BBQ Base, Cheese, Ham, Pepperoni, Prosciutto, Rib Eye Bacon. Kryptonite couldn’t keep you away from our tomato base topped with cheese, shaved leg ham and fresh cut Pineapple. Make your friends see green when you try our tasty tomato base topped with cheese, shaved leg ham, pepperoni, spanish onion, semi-dried tomatoes, mushroom, fresh pineapple, tomato, kalamata olives, roast capsicum and anchovies. Tomato Base, Cheese, Ham, Pepperoni, Onion, Semi-Dried Tomatoes, Mushroom, Tomato, Pineapple, Olives, Capsicum, Anchovies. No joke, a perfect winter warmer on a dark night… enjoy Hero’s tomato base, cheese, baby spinach, spanish onion, roast pumpkin and lamb all drizzled with delicious ranch dressing. Tomato Base, Cheese, Onion, Spinach, Pumpkin, Lamb, Ranch Dressing, Lemon. In brightest day, in blackest night have this pizza in your sight! Tomato base, cheese, spanish onion, marinated lamb, crumbled feta, cracked black pepper and topped with fresh rocket. Tomato Base, Cheese, Onion, Lamb, Cracked Pepper, Feta, Rocket. You’ll need to hide under your yellow sombrero after this; guacamole base, cheese, pepperoni, fresh tomato, capsicum, jalapenos, chilli flakes, sour cream and tabasco sauce. Guacomole Base, Cheese, Pepperoni, Tomato, Capsicum, Jalapenos, Chilli Flakes, Tobasco, Sour Cream. This is the perfect formula! Tomato base, cheese, mushroom, marinated steak, kalamata olives, rib eye bacon, topped with fresh rocket and drizzled with ranch dressing. Tomato Base, Cheese, Mushroom, Steak, Olives, Bacon, Rocket, Ranch Dressing. There’s nothing invisible about our BBQ sauce base covered with cheese, sliced Spanish onion, chicken and rib eye bacon. BBQ Base, Cheese, Onion, Chicken, Rib Eye Bacon. Demand our satay sauce base covered with cheese, marinated chicken breast, sliced avocado, chopped cashews and Freshly cut coriander. Satay Base, Cheese, Chicken, Avocado, Cashews, Coriander. Go to infinity and beyond with our fresh tomato sauce base, cheese, baby spinach, prosciutto, sliced avocado, chicken breast, parmesan cheese and drizzled with ranch dressing. Tomato Base, Cheese, Spinach, Prosciutto, Chicken, Avocado, Ranch Dressing, Parmesan. Transform your taste buds with Hero’s own tomato base, cheese, baby spinach, fresh tomato, chicken breast and rib eye bacon. Tomato Base, Cheese, Spinach, Tomato, Chicken, Rib Eye Bacon. If you feel like a little adventure try our delicious guacamole base, cheese, semi-dried tomatoes, baby spinach, chicken, feta and cracked Black Pepper. Guacamole, Base, Cheese, Semi Dried Tomatoes, Spinach, Chicken, Feta, Cracked Black Pepper. “You’ll be back” for Hero’s tomato base layered with cheese, sliced Spanish onion, mushroom, fresh tomato, kalamata olives, roast capsicum and chopped basil. Tomato Base, Cheese, Onion, Mushroom, Tomato, Olives, Capsicum, Basil. Turtalise your taste buds with our traditional tomato base layered with cheese, fresh tomato, parmesan cheese* and freshly cut Basil. Tomato Base, Cheese, Tomato, Parmesan, Basil. Sick of apples? Let your taste buds be dwarfed by our classic tomato base topped with cheese, roast pumpkin, artichoke, eggplant, capsicum, cream cheese, sesame seeds and fresh basil. Tomato Base, Cheese, Pumpkin, Artichoke, Eggplant, Capsicum, Cream Cheese, Sesame Seeds, Basil. All the veggies assemble here: guacamole base, cheese, semi-dried tomatoes, spinach, roast pumpkin, artichoke, mushroom, crumbled feta and cracked black pepper. Guacamole Base, Cheese, Semi Dried Tomatoes, Spinach, Pumpkin, Artichoke, Mushroom, Feta, Cracked Pepper. Lightning won’t strike twice, this will be the fastest pizza you ever eat. Enjoy our top of the range; BBQ sauce base topped with cheese, Spanish onions, king prawns, rib eye bacon, cream cheese and freshly cut coriander. BBQ Base, Cheese, Onion, Prawns, Bacon, Cream Cheese, Coriander. Had a hard day in the lions den? Been stuck in a chariot jam? Relax with our tomato sauce base topped with cheese, semi-dried tomatoes, prosciutto, king prawns, avocado and cream cheese. Tomato Base, Cheese, Semi Dried Tomatoes, Prosciutto, Prawns, Avocado, Cream Cheese, Lemon. The cosmic swells couldn’t destroy this, enjoy our tomato base topped with cheese, king prawns, semi-dried tomatoes, baby spinach, Spanish onion, feta, fresh basil and for class 100 strength, a hint of cracked black pepper. Tomato Base, Cheese, Prawns, Semi-Dried Tomatoes, Spinach, Onion, Feta, Basil, Cracked Pepper. What do you get if you cross a Smurf with a cow? Blue Cheese! Not this time; try Hero’s own tomato base, cheese, baby spinach, Spanish onion, king prawns, marinated steak and cracked pepper. Tomato Base, Cheese, Spinach, Onion, Prawns, Steak, Cracked Pepper. Go Joes! Tomato base, baby spinach, Spanish onion, king prawns, semi-dried tomatoes, parmesan, fresh basil, seasoned and drizzled with extra virgin olive oil plus chilli flakes. Tomato Base, Spinach, Onion, Prawns, Semi-dried Tomatoes, Parmesan, Basil, Cracked Pepper, Sea Salt, Olive Oil, Chilli Flakes. Go Janes! Tomato base, baby spinach, Spanish onion, tomato, roast chicken, roast capsicum, parmesan, fresh basil, seasoned and drizzled with extra virgin olive oil plus chilli flakes. Tomato Base, Spinach, Onion, Tomato, Chicken, Capsicum, Parmesan, Basil, Cracked Papper, Sea Salt, Olive Oil, Chilli Flakes, Lemon. Tomato Base, Spinach, Onion, Pumpkin, Mushroom, Tomato, Artichoke, Avocado, Parmesan, Basil, Cracked Pepper, Sea Salt, Olive Oil, Chilli Flakes. The force is strong with this one… Delicious sticky date and banana pudding topped with caramel sauce and ice cream. To die for chocolate and raspberry mud cake topped with chocolate drops, chocolate sauce and ice cream. Chocolate & Raspberry Mudcake, Chocolate Drops, Chocolate Sauce, Icing Sugar, Ice Cream. Make the ultimate sacrifice… Creamy custard, apples and cinnamon topped with crumble mix and ice cream. Icing Sugar, Custard Base, Apples & Cinnamon, Crumble Mix, Caramel Sauce, Icing Sugar, Ice Cream. Enjoy this more advanced, more deadly moist caramel cake topped with choc chips and ice cream. Caramel cake, Choc Chips, Icing Sugar, Ice Cream. Ham & Cheese served on a 10″ base PLUS a slice of C1000 Dessert Pizza. Includes a FREE Joke Toy!! Chicken & Cheese served on a 10″ base PLUS a slice of C1000 Dessert Pizza. Includes a FREE Joke Toy!! Fresh Rocket, Avocado, Walnuts, Parmesan & Balsamic Glaze. Rocket, Avocado, Walnuts, Parmesan, Balsamic Glaze. Baby Spinach, roasted sweet potato, walnuts, feta & Balsamic Glaze. Balsamic Glaze, Spinach, Sweet Potato, Walnuts, Feta. Pizza bread with extra virgin olive oil, garlic, mixed herbs, Maldon sea salt and cheese. Olive Oil, Garlic, Mixed Herbs, Sea Salt, Cheese. It ticks all the boxes. It’s bread. It has garlic. Need we say more? A staple side dish, that never fails to satisfy. Sour Cream, Sweet Chilli, Potato. Come in Superhero Style ‘With Your Undies On The Outside’. 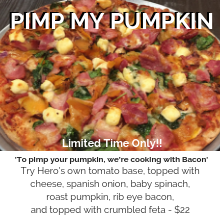 Saving Perth One Pizza at a Time!! Like a TRUE SUPERHERO we posses extraordinary powers and are committed to protecting the public from toxic, unhealthy, second rate pizza! We understand the benefit and importance of FRESH NUTRITIONAL FUEL. To ensure you are running on a full tank we keep our ingredients UNTAMPERED AND HEALTHY. We use minimal ‘Villians’ like sugar and salt, allowing the NATURAL FLAVOUR to shine. All this is done in a UNIQUE, FUN and ENGAGING environment. Let your hair down – smile a lot. Hero’s is Healthy, Nutritional, Great Tasting Fun! Here at Hero’s Pizza, we’re always interested to hear what you think. E-mail with comments, critiques, suggestions or . . . just to say, hi! This license shall automatically terminate if you violate any of these restrictions and may be terminated by Heros Healthy Pizza at any time. Upon terminating your viewing of these materials or upon the termination of this license, you must destroy any downloaded materials in your possession whether in electronic or printed format. The materials on Heros Healthy Pizza’s web site are provided “as is”. Heros Healthy Pizza makes no warranties, expressed or implied, and hereby disclaims and negates all other warranties, including without limitation, implied warranties or conditions of merchantability, fitness for a particular purpose, or non-infringement of intellectual property or other violation of rights. Further, Heros Healthy Pizza does not warrant or make any representations concerning the accuracy, likely results, or reliability of the use of the materials on its Internet web site or otherwise relating to such materials or on any sites linked to this site. In no event shall Heros Healthy Pizza or its suppliers be liable for any damages (including, without limitation, damages for loss of data or profit, or due to business interruption,) arising out of the use or inability to use the materials on Heros Healthy Pizza’s Internet site, even if Heros Healthy Pizza or a Heros Healthy Pizza authorized representative has been notified orally or in writing of the possibility of such damage. Because some jurisdictions do not allow limitations on implied warranties, or limitations of liability for consequential or incidental damages, these limitations may not apply to you. The materials appearing on Heros Healthy Pizza’s web site could include technical, typographical, or photographic errors. Heros Healthy Pizza does not warrant that any of the materials on its web site are accurate, complete, or current. Heros Healthy Pizza may make changes to the materials contained on its web site at any time without notice. Heros Healthy Pizza does not, however, make any commitment to update the materials. Heros Healthy Pizza has not reviewed all of the sites linked to its Internet web site and is not responsible for the contents of any such linked site. The inclusion of any link does not imply endorsement by Heros Healthy Pizza of the site. Use of any such linked web site is at the user’s own risk. Any claim relating to Heros Healthy Pizza’s web site shall be governed by the laws of the State of Western Australia without regard to its conflict of law provisions.